There is nearly one death from heart disease every 38 s in the United States (Lloyd-Jones et al. Circulation 121:e46–e215, 2010). Acute chest pain is the single most common complaint of patients older than 15 years of age presenting to the emergency department (ED) (Pitts et al. Natl Health Stat Report 7:1–38, 2008) and accounts for about 4% of ED visits in the United States (McCaig and Burt. Adv Data 340:1–34, 2004). Origins of chest pain include diseases of the heart, aorta, pulmonary system, esophagus, upper abdomen, and chest wall and even psychiatric disorders. 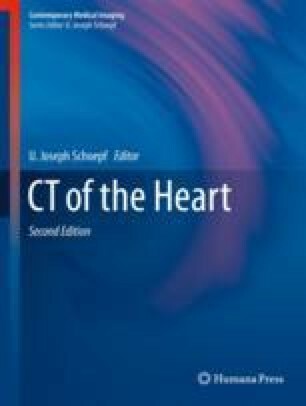 Determination of the etiology of the chest pain is often difficult, although different types of chest pain are classically ascribed to different corresponding diseases. Acute coronary syndrome (ACS) is estimated to be responsible for 20% of all clinical encounters for acute chest pain (Pozen et al. N Engl J Med 310:1273–1278, 1984). Patients with ACS present with unstable angina, acute myocardial infarction, or sudden cardiac death (Virmani et al. J Am Coll Cardiol 47:C13–18, 2006); therefore, timely triage of ACS is important as it affects treatment and prognosis. Also timely triage may save significant costs. Using coronary CTA to evaluate patients instead of admitting patients for a rule-out approach with serial troponin has the potential to save significant costs to the health-care system. Baumann S, Renker M, Hetjens S, Fuller SR, Becher T, Lossnitzer D, Lehmann R, Akin I, Borggrefe M, Lang S, Wichmann JL, Schoepf UJ. Comparison of coronary computed tomography angiography-derived vs invasive fractional flow reserve assessment: meta-analysis with subgroup evaluation of intermediate stenosis. Acad Radiol. 2016; https://doi.org/10.1016/j.acra.2016.07.007.